OK, so I was looking at my open paper pack with all those little strips of paper...mostly 1x12" or 1.5 x 12". I'm thinking, hmmmm, what can I do with those? I'm too tired to think up my own color combinations (plus, why work hard when someone else has done the work for you? ), so I just go with the colors and papers in this kit, which is called Stardust (X7109B, $12.95). The colors are Bamboo, Honey, Moonstruck and Topiary. Anyway, I decided to make a 4x4 card using 1x1 scraps (inchies!) and a pop-up technique that my daughter taught me from the 4th grade. - Cut two 1/2" x4" strips. - Position the strips perpendicular to each other (forming an "L" shape). - Glue them together at the ends where they overlap. - Fold one strip over the other, like an accordion or spring. - Continue folding, making a springy strip. I just put the "spring" under one of the squares. 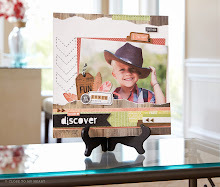 I loved using the Dream Big (D1399, $22.95) stamp set for this card. ANY of the little stamps in that set would work. I used Topiary ink (Z2155, $5.25). I like how easy this card was, but it's still kind of interesting. PLUS, it's using up scraps of paper. I didn't edge distress the little squares, but I think that would look nice, too. BONUS: This card will mail flat! No need for extra postage for sending a bumpy card...(unless you mail it in a square envelope). Oh man, I usually end up throwing those scraps away. If I salvaged all my scraps, there'd be enough to make a hundred of your cards, lol! You've inspired me to start using them instead. I keep 1" strips that are larger than 6" long, but I usually don't know what to do with them, either. I've got TONS!